Guam is the largest island of the Marianas. It is 30 miles (48 km) long and 9 miles (14 km) wide. It had been a United States island since its capture from Spain in 1898. ↑ Gailey, Harry (1988). 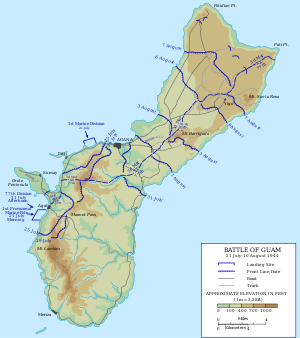 The Liberation of Guam 21 July – 10 August. Novato, California, U.S.A.: Presidio Press. pp. 90–112. ISBN 0-89141-651-X. ↑ Video: Allies Study Post-War Security Etc. 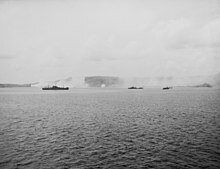 (1944). Universal Newsreel. 1944. Retrieved February 21, 2012. This page was last changed on 25 September 2018, at 20:18.